For some reason I seem to have lost this article in its finished format... I will get it fixed up guys. here is the rough draft i had saved on my pc. article should be back to its original splendor with in the week ... sorry for the inconvience. MTGBaron. The Art of DeckBuilding in Rainbow Stairwell. With the MTGO deck builder, building a deck is relatively simple. You can find your creatures and spells for each cost rather quickly. 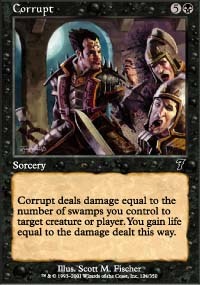 Find cards the do multiple things like the battle mages, Anarchist, or the Volvers are from Apoc. Remember you have 60 cards total and 24 of those are lands. Most of the players I have played run 4 basics of each color and 4 non basics. Temple Garden, Godless Shrine and my favorite Krosan Verge. Also there are no multi- colored cards or split cast cost cards allowed such as Glittering Wish or Boom/Bust, and all Wishes from judgment are banned in this format. With that said, now for the card selection!!!!! CC=1 BGURW and A. it’s easier to select the color you are going after for each choice. Lots of good one cc cards around for each color. Black- Vampiric Tutor is the ultimate choice, but if you don’t have one and don’t feel like spending a lot of tickets on one I would recommend one of the following. Darkblast or Deathmark. Pick the card that works best for you. Green – Reclaim is my favorite for this spot. But other choices are Lay of the Land, Essence Warden, or Worldly Tutor. Again pick the card that’s best for you. Blue – Mystical Tutor hands down best blue card for this spot. It works in all the decks, it gets that mana fix or spot removal they’re powerful card in this format. Red - Shattering Spree - my favorite choice for this spot, artifact hate is always good... Skred, Kird Ape or Shock are also good choices. White - Swords to Plowshares, Weathered Wayfarer, (Steelshaper’s Gift) There are tons of cards good in this spot. Artifact - (Sensei’s Divining Top) seems to be the #1 choice, but Scrabbling Claws, (Wayfarer’s Bauble) or AEther Vial are all good picks. Now for the 2 drop cards. Green - Sylvan Scrying, it lets you fetch any land. There are a lot of cards to pick from for this spot. Sakura-Tribe Elder, Rampant Growth or Naturalize. Those are some of my preferred picks. Blue - Think Twice, Compulsion ... there are a few cards for this slot whether its card advantage you want or mana acceleration..
Red - Ancient Grudge, Magma Jet are a couple of preferred picks for this spot. 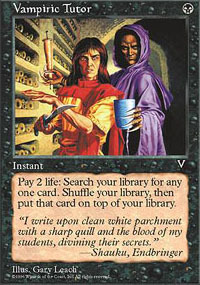 White - Degavolver, Disenchant, Judge Unworthy or Serra Avenger good choices for white. 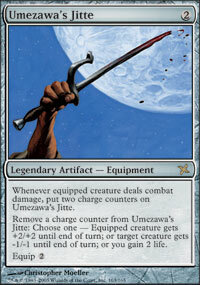 Artifact - (Umezawa’s Jitte), Candles of Leng or Journeyer's Kite are the ones I tend to run. Pick what fits your deck best I can’t stress this enough. On to the 3 drop. 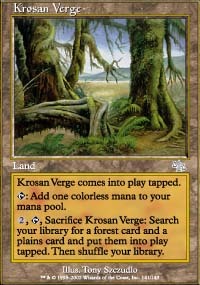 Some of my favorite cards are 3 drops. Black - Necravolver is such a bomb in this format. 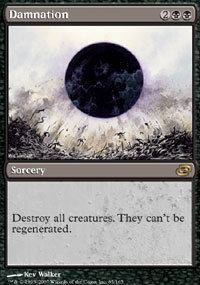 Or run Exotic Curse, Hypnotic Specter or some form of removal. Personally I have Necravolver and I USE him. Green - So very many choices here, I could ramble all day on this pick. Eternal Witness, Thornscape Battlemage, Ana Battlemage, Call of the Herd. It's all about what works best with your deck. Blue - Stormscape Battlemage, Fabricate or Circular Logic are my favorites for this spot. Red - Rakavolver hands down here. But Char or Thunderscape Battlemage are also great cards for this spot. White - Sunscape Battlemage, Orim's Thunder, Cleanfall or Tempest of Light are all great cards for this spot. Artifact - Loxodon Warhammer, Sword of Light and Shadow, Sword of Fire and Ice or Darksteel Ingot. All of these artifacts fit well in most decks, so choose wisely! Now for the magical 4 drop. Green - Harmonize, Nantuko Vigilante, Mwonvuli Acid-Moss or Stonewood Invocation are all great picks for this spot in your deck. Blue - Gifts Ungiven, Deep Analysis, Mystical Teachings or Treasure Trove are some good choices for the deck. Personally I run Gifts, it gives huge advantage over the rest. Red - Desolation Giant, Flametongue Kavu, Shivan Wumpus or Sudden Impact are solid choices for this red spot. I personally favor FTK or Desolation Giant. White - Wrath of God, Loxodon Gatekeeper, Calciderm or Guardian of the Guildpact are great cards for this spot. Moving Right along to the 5 drop! Black - Desolation Angel, Crypt Angel, Ribbons of Night, Moonlight Bargain or Festering March. There are some hard choices to make depending on budget and deck style. I personally play the Desolation Angel, but ran Ribbons before the switch. 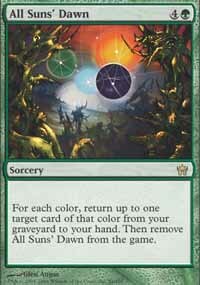 Green - All Suns' Dawn is the best pick for this spot, and it’s relatively cheap. How ever if you don't have one I would recommend one of the following. Genesis, Hibernation's End, Jolrael, Empress of Beasts or Tranquil Path. Blue - Rush of Knowledge, Magus of the Future, Meloku the Clouded Mirror or Serra Sphinx are my picks for this spot. If you choose to run Magus I would recommend also running Gilded Lotus in your artifact 5 spot. Red - Anarchist, Lava Axe, Torchling or Gathan Raiders. I have seen them all ran, and prefer Anarchist over the rest. White - Evangelize, Spelltithe Enforcer, Serra Angel or Imperial Mask. Here I normally pick Evangelize over the rest every time. I like to play with the opponents cards!!!! Artifact - Stuffy Doll, Ornate Kanzashi, Gilded Lotus or (Clearwater Goblet). Very hard picks here. I have seen them all played a lot, and Ornate Kanzashi is very dirty!!! Finally we come to our 6 drop!!!!!! Black - (Kokusho), Enslave, Corrupt or Twisted Abomination are nice choices for this spot. Green - Arctic Nishoba, Tromp the Domains,Fangren Pathcutter or Deadwood Treefolk. Treefolk is awesome in this format!. Blue - Draining Whelk, Ethereal Usher, Confiscate or Tunnel Vision. Yes I said it Tunnel Vision. Red - Magus of the Arena, Slice and Dice, Firemaw Kavu or Oni of Wild Places lot of fun cards in the red 6 spot. Shivan Dragon or (Paradic Dragon) I tend to run Slice and Dice or Magus of the Arena. 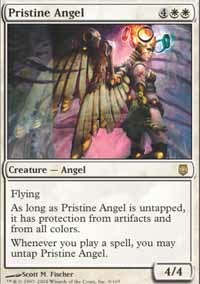 White - (Final Judgement), Exalted Angel, Pristine Angel or Noble Templar are some great choices for your deck. Now for our non basic lands!!!! RGD Shock lands work nicely, Steam Vents, Breeding Pool Godless Shrine to name a few. So do lands Like Academy Ruins or Urborg, Tomb of Yawgmoth. And here we have it all brought back from the wasteland in the system!!!! I liked the article... its kind of a crash course of what to expect in a typical RS game. In the next article I would like to see a review and breakdown of some of the more popular archtypes. Doing some side by side comparison would be valuable. All in all I think it was well written and waiting to see more on RS. Awesome Matt! I had always wondered about this formt and what it would take to build a good deck for it. It seems to have a good fanbase all its own! Great job! I thought the article was ok. It basically just listed the "good stuff" at each color and cc. I was hoping that you would break it down and show what cards excelled in aggro builds and what would be better choices for control. Fact or Fiction, Rout, Oblivion Stone & Akroma's Vengeance are some other control cards that have worked for me. The combo deck that was mentioned spiked my interest. Will you be featuring odd RS deck types in the future? I made a rs mill deck that is really fun and unexpected. I would love to see what other creative decks are out there. "Passengers will refrain from killing my soul." ALRIGHT! Rainbow Stairwell. A personal favorite. Thanks for bringing this up to the community. Hopefully we can get RS FFA going.